Kings Forest development plan includes 4500 housing lots, a golf course, two primary schools, and shopping facilities, and will occupy a large area between Kingscliff and Cabarita with a single entrance along Tweed Coast Road. The social impacts of this development are huge. Just what will life look like with another 15,000 or so people driving around, looking for parking, jobs, needing infrastructure like hospitals, schools, libraries? Who will pay for the infrastructure - ratepayers? While it is commonly believed by local businessmen that this will be good for business, the truth is that an increase in population may not automatically create employment, because most of the jobs created will be short term construction jobs and at the same time there will be an increase in job seekers. There are many environmental impacts of this development, especially the risk to the remaining population of 144 Tweed Coast koalas, placing the population at high risk of localised extinction. Also at risk are 21 Threatened Species of fauna including the Wallum Froglet, Wallum Sedge frog, Grass Owl, Bush Stone Curlew and Long-Nosed Potoroo, 6 species of flora and 3 endangered ecological communities. Many changes will be needed to protect adjacent Cudgen Nature Reserve and State Significant Cudgen Lake, which could well be at risk. The developer should dedicate land to the Nature Reserve ahead of the development so that the flora and fauna can be protected from the bulk earthworks. Bulk earthworks will move 1 million cubic meters to flatten out the site for housing. The development application has not indicated when the land will become reserve, it may happen after it has already been seriously disturbed. Fencing of the nature reserve should also happen ahead of the development to protect fauna that try to move through the development. The fencing should be of a different specification to what is proposed by the developer - it needs to be floppy top cyclone fencing, or the koalas will climb over it. Friends of the Cudgen Nature Reserve is concerned about the water course to Cudgen Lake, and also the drainage pattern which appears to using Blacks Creek as the major channel to drain KF which then goes through the nature reserve. Unless certain extra measures aren’t taken, this development will threaten the viability of the nature reserve, a jewel in the Tweed Coast. In addition to Section 94 contributions, there should be an environmental maintenance fund established by the developer because a lot of the environmental measures they propose have no monitoring, feedback or evaluation. It's not realistic to assume people are going to move in with their dogs and just obey a few signs. 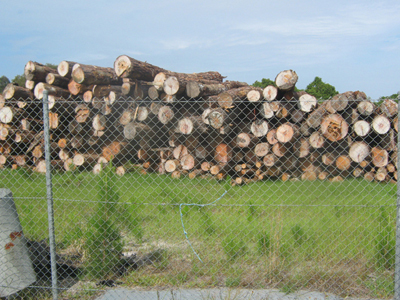 Kings Forest has confusion and conflicting development application information. It has almost no Ecologically Sustainable Development 'footprints' concerning the future wellbeing of the people who currently live and work on the Tweed Coast. The demonstrated community consultation and awareness about this development is completely lacking. The owner and developer of Kings Forest is not even a Tweed Shire resident, who has cleared and mismanaged valuable ecological wetland areas, native wildlife habitats and altered catchment profiles of Tweed coastal land. There has been no invitation to qualified individuals with excellent local knowledge who could help the developer and workers on the property manage it in a sensible ecologically sustainable framework. There should at least be a moratorium placed on this development by the NSW and Federal governments until issues of past rezoning processes, past and current land and water management issues and illegal clearing of valuable ecological habitat are resolved. It is up to the NSW State and Federal governments to actively pursue these questionable issues. Many in the community are voicing an urgent need for remedy to the current mismanagement of this development and to the development's processes which needs to be addressed before further works continue on the site. The habitat and ecological damage that has already occurred could take decades to repair, some may never be repaired, if the development goes ahead as per current planning documents. Nor does there appear to be any documented environmental benchmarks attached to the past and current development process by which environmental accountability can be assessed. The cost of this urgent remedy should be borne by the developer, not Tweed shire community. 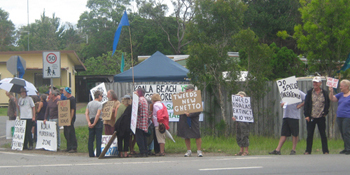 The valuable community environmental volunteers who have been serving the Tweed coast for many years appear to have been very poorly treated by the regime that is Kings Forest Part 3a development. While we are, she’s being raped and robbed – we’ll fight for what’s left. As of 24 January, Tweed Shire councillors recommend that Dept of Planning allow dogs at Kings Forest. It looks like the planning completed for this development is totally corrupt. No surprise in the Tweed. It would be hard to briefly describe the number of concerns. Koalas, water, town planning, modern sustainable practices....possible removal of trees/flora before approval -currently under investigation. Australia does not have high fertility levels. The problem is our hign immigration intake, exacerbating our species extinctions and destroying bushland, and living standards in Australia. Instead of increased productivity these days, the buzzword we are supposed to use now, increasing population will mean a gridlock of congestion, depletions and ruin. Australia has inherited a rich biodiveristy, and slow evolving ecosystems and species. The deliberate destruction of koala habitats is akin to "genocide", species destruction. Such misathropic growth can have not justification. Biologists estimate 20,000 to 40,000 species go extinct every year, many times higher than the "background extinction rate" built into the evolutionary process. The cause? Human environmental impact, the product of consumption times population. Dr. Warren Hern's "Humans as a Cancer on the Earth" hypothesis is based on the observation that cancerous growth has much in common with the characteristics of human population growth. These include: “1) rapid, uncontrolled growth, 2) invasion and destruction of adjacent tissues and environments, 3) metastasis, or spread by colonization, 4) dedifferentiation, or loss of distinctiveness in individual components” and “furthermore, the malignant process in an individual or an ecosystem often involves the production of toxic metabolites. No population of a large vertebrate animal in the history of the planet has grown that much, that fast, or with such devastating consequences to its fellow earthlings. Our iconic koalas are under threat from a runaway human invasion! In fact, all native species have been impacted by the growth of human populations, and as koalas are competing with the same locations, they are losing out badly. Premier Anna Bligh is happy to create, manipulate and profit from a human population explosion at the expense of wildlife habitat and to willingly make human invasions a greater threat to Queensland than those of the unwitting cane toad. The illegal clearing in the Cudgen Nature Reserve adjacent to the Kings Forest development site needs to be heavily penalised and an environmental compliance officer located at the development site at the cost of the developer to ensure such a "mistake" cannot happen again. Growth lobby wants koalas to go extinct. Thanks Menkit for another of your fantastic articles - straight to heart of the matter and signalling another serious battle. Last Thursday, on 3RPP, I interviewed a Victorian lawyer who recently did a masters in environmental law and confirmed her impression that our laws are almost completely useless, due to the problem of standing (being entitled to bring about an action) in the states, particularly Victoria, the expense of the courts, the tendency for governments to change the laws, and the failure to monitor species numbers properly - among so many problems. Even if you get a win, no-one will enforce it. Look at Environment East Gippsland and VicForests. My guest also raised the fact that every year now for decades Australians try to make the koala recognised as a threatened species, and every year the matter gets sidelined, yet every year the koala gets closer to extinction. The reason? Developer lobbies want the koala to become extinct so that they can develop its remaining habitat. And why are koalas going extinct? Because of Australian developers, who are bulldozing their last vestiges of habitat - and lobbying for high immigration and foreign purchasers. Until the growth lobby and developers in particular make a stand for the koala theirs should be identified as the most shameful occupation in Australia. The development and growth lobby is the koala's worst enemy. Blame developers for koala extinction. Make that your primary message. Associate the damage with the industry that profits from it and display pictures of the developers and the politicians that protect them at your protests. It is inconceivable to think that this development has been approved and is going ahead despite the environmental impacts. The ramifications of this are wide spread and a review needs to be done to ensure that the fragile eco systems are preserved, better still stop the development! A study carried out by ecological consultancy Biolink estimated there were 140 koalas left in the Tweed region last year. The president of Team Koala, a carers group in Tweed Heads, Jenny Hayes, says the future of the district's koala colonies will be in jeopardy unless plans to ban dogs from the residential area are adopted. A report prepared by professional planners about the Kings Forest development is endorsed by the local council. "Professional planners" are more interested in human concerns and profits from developments than koalas. How are they going to "plan" so that koalas and urban development housing can exist side by side? Not likely! How are people going to exist without cars, housing without denuding the area of trees, without dogs and cats and without the noise, pollution and stress? They had 3,000 submissions, mostly about supporting koalas. Tourists and residents don't want to come to see housing, and generic urban sprawl. They come to see Australia's wildnerness, natural setting, beaches, and wildlife. In the Kings Forest submission, prepared by the director of planning, there was a recommendation that all dogs be banned at Kings Forest to protect koala populations. The Tweed Coast Koala Habitat Study 2011 was undertaken which showed the dangers of dogs to koala populations in the area. It ignores cruel sadistic attacks, traffic, and loss of habitat trees. Once timber supplies were exhausted the Tweed Valley became a centre for sugar cane and banana growing. Population was minimal until the 1880s, with growth during the late 1800s. Significant development did not occur until the post-war years, with the population of the Shire increasing from about 19,000 in 1947 to 22,000 in 1961, then to 25,000 in 1971. The population of Tweed Heads is "forcast" (or will be boosted) to be over 91,000 this year, and to increase to 128,000 by 2031. Retirement is a considerable source of Tweed Heads' notable population growth while tourism is the primary source of income. This source of income will be compromised by it's transformation to urban sprawl and loss of it's identity as a place for our iconic marsupials - koalas. Tuesday's landslide in the Papua New Guinean mountain town of Mendi, which has reported as many as 60 people dead or missing, is likely due to deforestation and mining. Similarly, the Tweed Shire's ongoing deforestation such as that currently threatening Kings Forest will see Tweeds fancy new 'River Device' brand come back to haunt it. How many people have been evacuated from Tweed Shire homes this time around? Check today's news report. 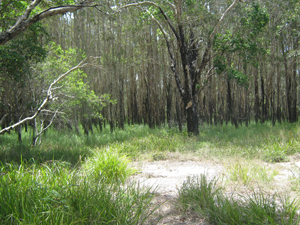 Council approval of deforestation and encouraged land use development has massively increased surface runoff and is culpable negligence, just like the Brisbane City Council's approval of riverside developments on flood prone river flats and the Queensland Government's encouraged deforestation of the Brisbane River valley out along the Warrego Highway to Ipswich and Toowoomba. Bring on class actions and drive the Tweed Shire Council bankrupt! 'Together Forward'...and out to sea! The possibility of a population cap for the Tweed has been raised by Councillor Katie Milne. However mayor Barry Longland says he doesn't believe a survey would be helpful and doesn't support the idea of a specific population cap. He said the council already controlled population growth indirectly. Then why this destructive new "development" site? Noosa Shire: Noosa Shire has long recognized the significance of the magical Noosa River to its citizens. Noosa has been really innovative and forward thinking and worked out how many people can be sustained by its resources. They looked at water, infrastructure and giving nature enough space. Noosa has steadfastly resisted the temptation to allow its population to grow beyond its capacity to take water without tapping the Noosa River. It has installed a population cap. The evaluation of population size should also include not just natural resources that support human populations, but about giving indigenous animals such as local wildlife a "fair go" - a chance to survive. All species try to advance their own interests, and take territories away from other herds or species, but with chainsaws, developer greed and an economy based on growth, there is little koalas can to to retaliate, or adapt. Thus, we must do it for them. See also: Sunshine Coast population to hit half a million by 2030? of 22 Sep 2008 about Noosa Shire Mayor Bob Abbot's population cap.